Less than one kilometre off the south-eastern coast of Mauritius, near Mahebourg, lies a small (27 ha), low lying coralline island, Ile aux Aigrettes. Like so much of Mauritius, it had been devastated by man’s activities – deforestation and the introduction of invasive species of plants and animals, leading to a loss of most of its indigenous biodiversity. Following its designation as a nature reserve in 1965, in 1985 the Mauritian Wildlife Foundation (MWF) began a restoration programme to provide a refuge for some animals and plants that had become critically endangered with extinction on the mainland. I had visited Ile aux Aigrettes in 2008 and been impressed with what had been achieved, and was delighted to have an opportunity in November 2018 to re-visit and see how it had developed over the following 10 years. On disembarking from the small boat that transfers visitors from a quay just south of Mahebourg, the short track up to the research station revealed that the only remaining dry coastal forest in Mauritius is thriving. 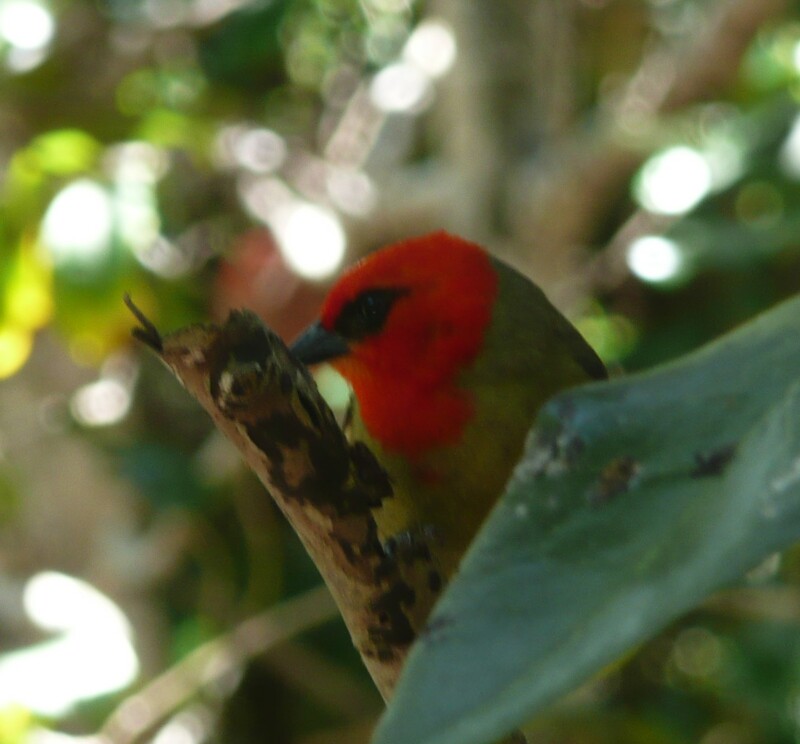 Consisting largely of endemic trees of Mauritius and free of rats and cats, it offers suitable habitat and safe refuge for a variety of endemic animals that have been released here. Some of them were critically endangered, having survived in very small numbers on the mainland or on a few other coastal islands. 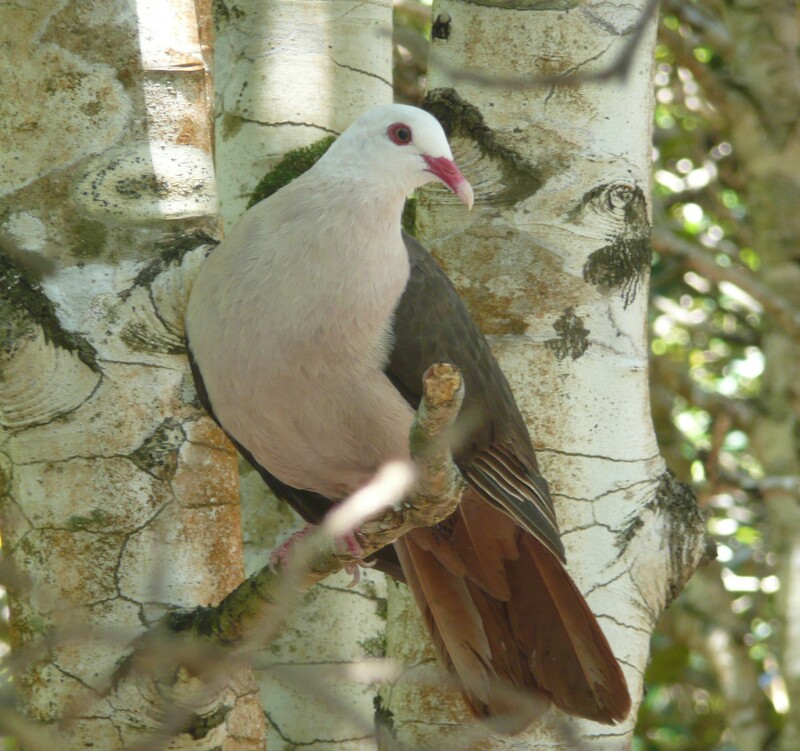 Public access, under guidance from MWF staff, offers visitors the best chance they will have in Mauritius of seeing Mauritius Pink Pigeons, Mauritius Fodies and Mauritius Olive White-eyes, all brought back from the brink of extinction by the dedication of MWF. 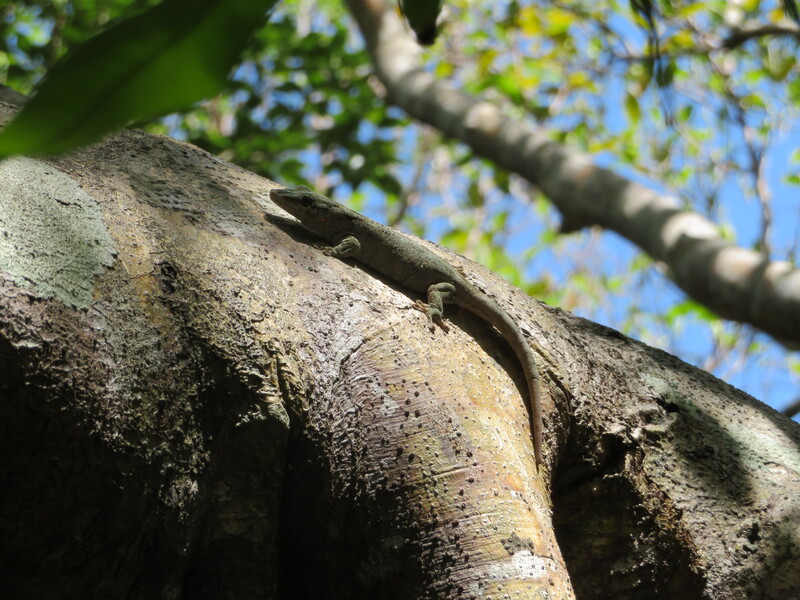 In addition, you might be lucky enough to see some of the reptiles that have been released on the island, Telfair’s Skink, Günther’s Day Gecko and the attractive little Ornate Day Gecko. 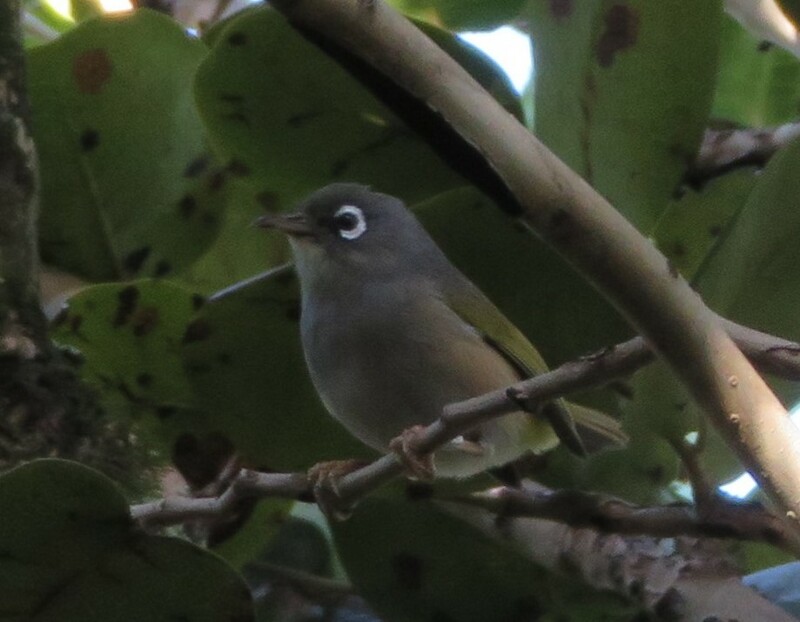 Alongside these Mauritian endemic species, some of Mauritius’s introduced birds also live on Ile aux Aigrettes: Madagascar Turtle Doves, Barred Ground Doves, Madagascar Fodies, Red-whiskered Bulbuls and Common Mynas are regular, the last two of particular concern because they eat eggs and chick of smaller birds, including the endemics. Worryingly, two other predators have recently gained a foothold on the island: House Crow and Tenrec. House Crows are spreading inexorably around Mauritius and now nest on the mainland close to Ile aux Aigrettes. They regularly visit the island and look intent on breeding there. During my visit we found eggs, thought to have been Madagascar Turtle Dove, broken on the ground beneath trees where House Crows were frequently seen. Tenrecs, introduced to Mauritius (and also Seychelles) from Madagascar, are rather hedgehog-like mammals, with long snouts and spiny backs. They are omnivorous and, besides sometimes taking birds’ eggs and chicks, can have a profound effect on populations of insects and other invertebrates, thereby competing for food with endemic birds and reptiles. While the island’s proximity to the mainland benefits people with an interest in natural history and helps to stimulate an interest in schoolchildren, it also means that conservation staff must be ever vigilant for potential invaders and have the capacity to eradicate any of these arrivals as soon as possible. A more intractable threat comes from climate change induced sea level rise. Fortunately, the island lies inside Mauritius’s barrier reef around the south-east coast and thus receives some protection from rough seas, but this could be negated by higher water levels, threatening all of the low-lying coastal areas. And what about the island’s name? Sadly, there are no longer any egrets on the island!